Buffalo cauliflower wings are easy to make at home and taste incredible to veggie and meat lovers alike. Serve these as a game day appetizer or as a side to your favorite dinners. 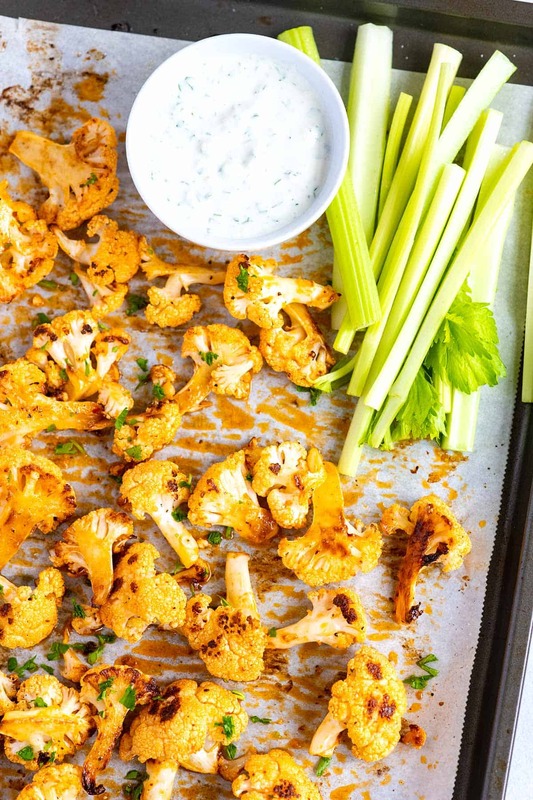 Jump to the Easy Baked Buffalo Cauliflower Recipe or read on to see our tips for making it. We love buffalo hot sauce around here. It’s featured in many of our recipes including our baked chicken hot wings, this easy buffalo chicken pizza, and even in this rice bowl. We love it so much that we’ve even shown you how to make buffalo wing sauce at home. 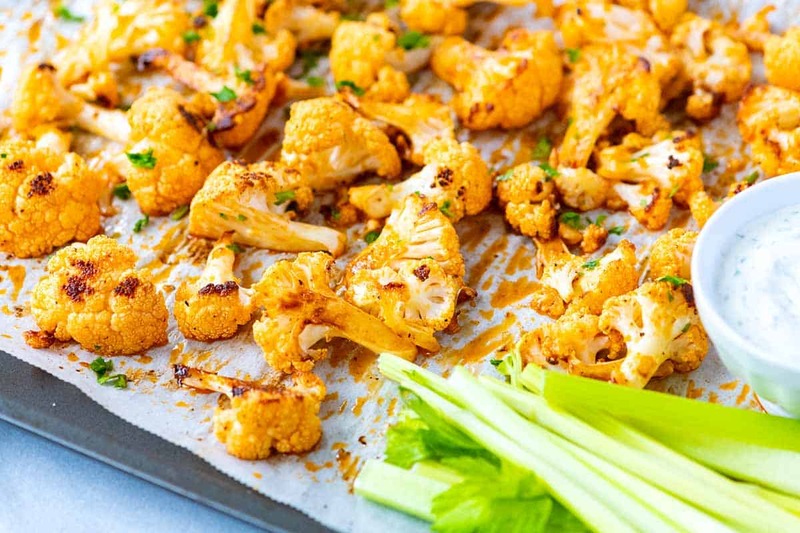 This time, we’re showing you how to turn regular cauliflower into a tasty and addictive snack. These cauliflower “wings” are inspired by buffalo chicken wings. 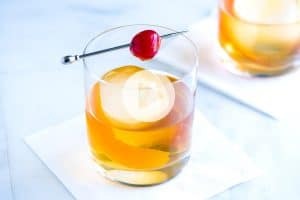 They are simple to make and in our experience are gobbled up by just about anyone. 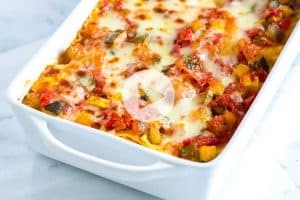 Adults, kids, vegetarians, and even meat lovers love this recipe. 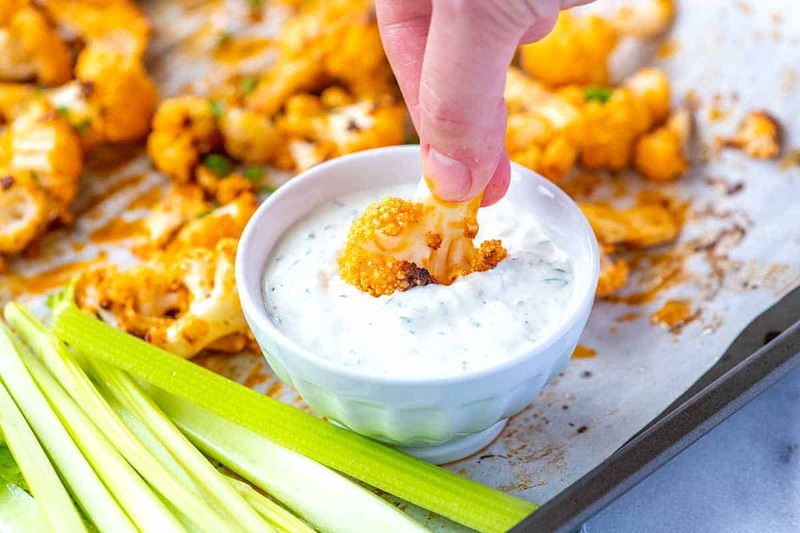 If you’ve scanned other buffalo cauliflower recipes, you may have noticed that the cauliflower is often breaded or dipped into a batter before baking. We don’t do this and find that if you properly roast the cauliflower and then toss it with a delicious buffalo sauce, we are happy campers. Our method takes less prep time and fewer dishes. Win! Roast cauliflower in the oven until tender and browned. Toss with our easy homemade buffalo sauce. Let’s quickly chat about roasting cauliflower — we already shared these tips in our ultimate roasted broccoli recipe (by the way, broccoli would be an excellent stand-in for this vegetarian buffalo wings recipe). Stick with one size and make sure that you cut the cauliflower into similar sized pieces. It’s up to you how big, but make sure everything on the pan looks similar in size. This way, everything roasts evenly. Create lots of flat edges. Instead of pulling the florets apart to look like the tops of round trees, slice the florets in half or quarters, which creates a flat side. When you arrange the cauliflower on the baking sheet, place the flatter edge down. As the cauliflower roasts, the flat edge will get nice and brown. Don’t overcrowd the baking sheet. This goes for other roasted vegetables, too. Arranging the cauliflower too close together causes them to steam instead of roast. Roast the cauliflower at a high temperature. To get the crisp brown tips and caramelized stems, go for an oven temperature of 400 to 450 degrees Fahrenheit. We usually go for 425F, but you can adjust based on what else might be in the oven. At 425F, the cauliflower will take between 20 and 25 minutes. Check the cauliflower towards to end of roasting. Look for the tips of the florets to be browned and crisp and the stems to be tender. You’re going to start with two main ingredients: butter and hot sauce (no wonder it tastes so good!). If you don’t eat butter, we have shared substitutes in the recipe below. Melt butter over low heat — I like low heat since it keeps the butter creamy and there isn’t any risk of it browning. 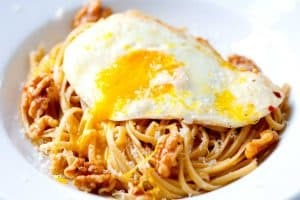 When the butter has melted, take the pan off of the heat, and then whisk in your favorite hot sauce and garlic powder. You can make enough sauce for one batch of buffalo cauliflower (which we’ve shared below in the recipe), or you can make a big batch and keep it in the fridge for when your next buffalo sauce craving hits. It lasts for weeks! Here’s our recipe for a large batch of sauce. 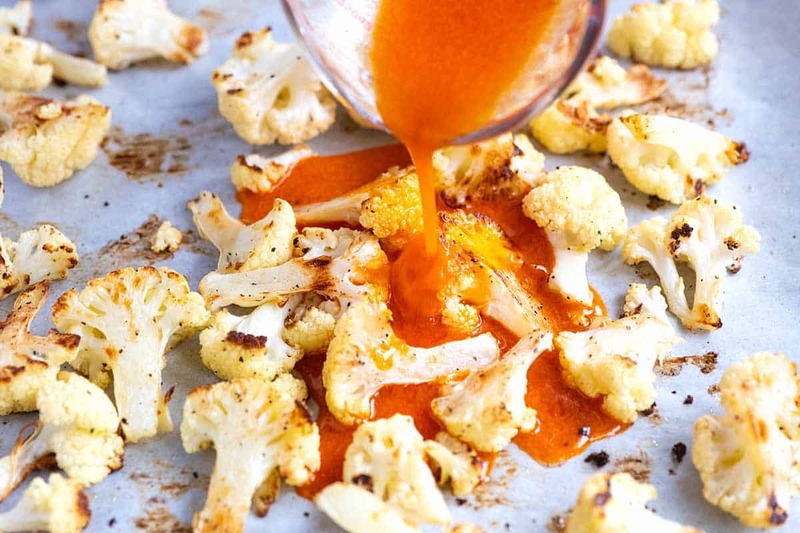 Once you have perfectly tender and caramelized roasted cauliflower, toss it with the homemade buffalo sauce. We do this right on the baking sheet. Then to make sure that it’s extra tasty, we slide the baking sheet back into the oven and bake another five minutes. In this time, the cauliflower absorbs the buffalo sauce, and the butter in the sauce begins to sizzle. After five minutes, you’re ready to serve. I love serving with crisp cool celery and a bowl of homemade blue cheese dressing, but ranch or another creamy dressing would work, too! Buffalo cauliflower wings are easy to make at home and taste incredible to veggie and meat lovers alike. Serve these as a game day appetizer or as a side to your favorite dinners. Heat the oven to 425 degrees Fahrenheit. Line a baking sheet with parchment paper, foil or a silicone baking mat. Cut cauliflower into florets, rinse and pat very dry. Add the florets to the baking sheet then toss with the oil, 1/2 teaspoon salt, and 1/4 teaspoon fresh ground pepper. 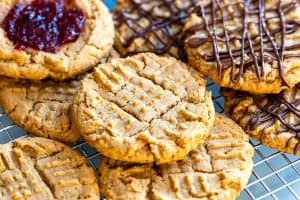 Spread them out, facing as many of the flatter edges down onto the baking sheet so that they brown nicely. Roast, stirring after 15 minutes, until the edges are crisp and brown and the stems are tender, 20 to 25 minutes. When the cauliflower is almost done, make the buffalo sauce. Melt the butter in a small saucepan (or use a microwave). Slide the pan with melted butter off of the heat, and then whisk in the garlic powder and hot sauce. Toss the buffalo sauce with the roasted cauliflower, and then place back into the oven for 5 minutes. Serve immediately alongside celery and a creamy dipping sauce like ranch or blue cheese. Making a large batch of buffalo sauce: This homemade buffalo sauce lasts for weeks in the fridge. To make a large batch, see this buffalo sauce recipe for the ingredient amounts and storing suggestions. Dairy-free / vegan-friendly recipe: Replacing butter with a vegan butter substitute should work. (We have not tried this). We have tried olive oil and did not like the taste. It tasted too much like olive oil and brought out a peppery flavor that the butter seemed to soften. Nutrition facts: The nutrition facts provided below are estimates. We have used the USDA database to calculate approximate values. We assumed full-fat salted potato chips. For fewer calories and fat, use baked chips.